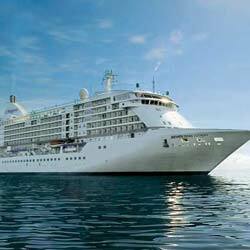 Experience six-star cruising aboard Voyager! Seven Seas Voyager boasts a refreshed elegant style in her restaurants and lounges, as well as luxurious decor across her 350 suites. And with 447 international crew on board, personal service is exceedingly indulgent throughout. Among her four dining options that allow guests to savor meals whenever and with whomever, Seven Seas Voyager features the modern French restaurant Chartreuse and the largest specialty restaurant at sea, Compass Rose. In addition to the elegant decor, the ship offers five production shows at the Constellation Theater. Book any available stateroom category on this sailing and enjoy a complimentary onboard credit plus exclusive savings. Another benefit of booking through us, your Regent Seven Seas Cruise Specialists. 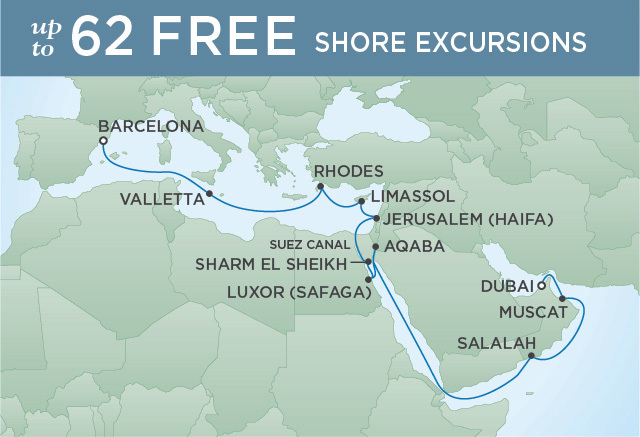 Save up to $15,000 per suite when you book one of these select voyages. Prices shown include bonus savings. Fares are per person in US dollars, based on double occupancy. All prices, discounts and special offers are subject to change without notice. Not all special offers available in all Categories/Prices. Availability and pricing is not guaranteed until booking and deposit received. indicates reduced pricing that may be time sensitive with limited availability. Except as specifically noted for "Cruise-Only" offers, fares shown include all surcharges, airline fees and government taxes; roundtrip airfare from select U.S. and Canadian gateway cities (Penthouse Suites and higher on European cruises includes Business Class Air); unlimited shore excursions; luxury hotel package with ground transfers; all shipboard gratuities; complimentary beverages, including select wines and spirits served throughout the ship; complimentary 24-hour room service; Butler service in Penthouse Suites and above; in-suite mini-bar setup for suites with butler service; refrigerator stocked with soft drinks, beer and bottled water replenished daily, specialty dining with no additional fees; fitness programs and much more. See the complete list. I have sailed with Regent Seven Seas in the past.